Lewin Barringer was without doubt one of the most talented of the early pioneers of our sport of soaring. But his life was all too short. As a saddening blow to the aviation industry in general and to members of the Soaring Society in particular, came the news on January 24, 1943, that Lewin Barringer had been lost over the Caribbean. Due to the widespread understanding of his contributions to our sport, the Barringer Trophy was established to recognize "the pilot making the greatest straight-line distance soaring fight during the previous calendar year, other than at the U.S National Championships." Lewin Barringer's whole adult life seemed to be focused on aviation and the furtherance of soaring activity. He was educated at Haverford School in Pennsylvania and at Princeton. 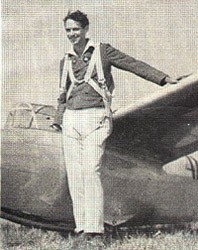 He attended the Ludington Flying School in Philadelphia and graduated in July 1929. He flew airplanes and commercial gliders from 1930 to 1943. He did research work on early aircraft for the Franklin Institute in London, Paris and Munich. He was active in the Pennsylvania National Guard with Army ratings of Air Observer and Airplane Pilot. Letter from Ed. T. White to SSA Headquarters, Sept 1, 1980: "In the spring of 1941 I was an instructor for Southwest Airways (Thunderbird Field) at Phoenix, Arizona. Lew came into our organization as a public relations man. One night he showed us some 8 mm film he had taken of the German training units, and the scope of their operations. Lew preached and finally sold to our boss, Leyland Heyward, the President of Southwest Airways, the idea of gliders in the Air Corps. Mr. Heyward in turn, sold his personal friend, Gen. H.H (Hap) Arnold, Chief of the Air Corps the idea. Gen. Arnold then established gliders as part of the Air Corps. In return Southwest Airways received a glider training school at Twentynine Palms, California. Lew went to Washington as a Major in the Air Force in charge of glider training." On the public record, of course, are his national and international soaring records. In 1938 he established an American distance record in a flight of 212 miles. Again in 1939 he set a two-place altitude record of 6,556 feet and came back in 1940 to establish the international two-place altitude mark of 14,960 feet.